The Orthodox monastery of Agia Triada (Αγία Τριάδα) located on the northern part of the Akrotiri peninsula is one of the most beautiful and richest monasteries in Crete. 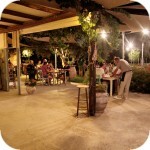 Surrounded by cypresses, vineyards and olive groves, where olive trees still grow up to an age of up to 500 years. The abundance of nature the monks use perfectly producing 20 tons a year of organic virgin olive oil. The quality of this olive oil pressed in the traditional way on the monastery presses attests to international prizes. European certificates for organic products and the PGI mark (Reserved Geographical Indication) guarantee that the oil is extremely healthy and tasty. It should not be surprising that the vast majority of them goes on sale on foreign markets. The nuns also cultivate their vineyards in a completely ecological way, excluding the use of chemical agents. The fact that this is a good direction in farming can be seen by buying one of the four types of wines produced here: Cabernet Sauvignon, Merlot, Fokiano Remeiko (local strain) and Trebbiano. In addition to the oil or wine in the monastery shop, you can also buy balsamic vinegar, crayfish, honey or soap made on the basis of olive oil. Agia Triada Monastery Tzagarolon was established in 1634 on the site of a former small monastery dedicated to the Holy Apostles. The brothers Lavrentios and Jeremias Jagarolon from the well-known and important Cretan-Venetian family Tzagarolos contributed to its creation. 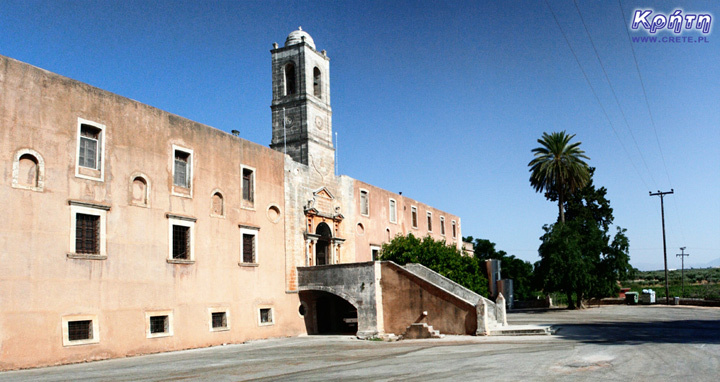 Jeremias designed the church and started its construction in 1611. Unfortunately, he did not finish it. After his death, the work continued Lavrentios. 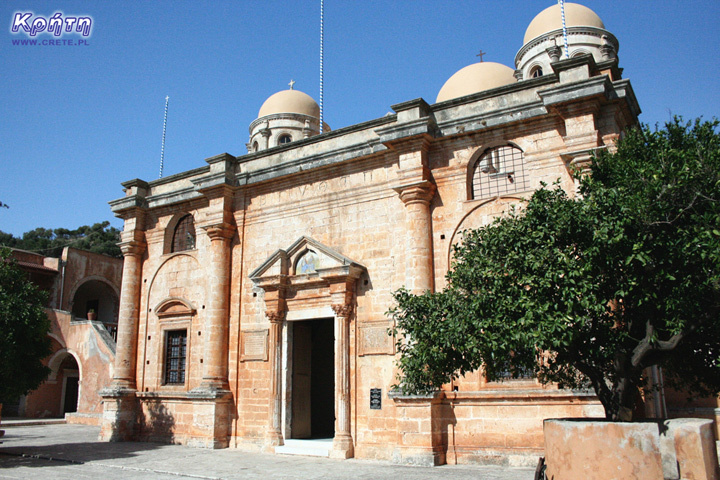 In 1645, the Turks took over the control of Crete, so the monastery also fell into their hands. This forced to stop all construction works carried out on its premises. Under Turkish rule, this monastery was known as Selvili Manastir (Cypress Monastery) presumably because of a road planted with cypress trees that led to it. In 1821, an uprising against the Turkish authorities began in Greece. Monks living in the monastery managed to escape, leaving historical relics and manuscripts, which unfortunately were destroyed by the Turks. In the same year, the monastery was burnt. After Greece regained its independence, construction work was completed and all the damage caused during the Turkish occupation was removed. At that time, the monastery greatly increased its wealth and expanded its activity. During the Second World War, in the monastery, the Greeks stored supplies for the Navy, but later the buildings were taken over by the Germans. 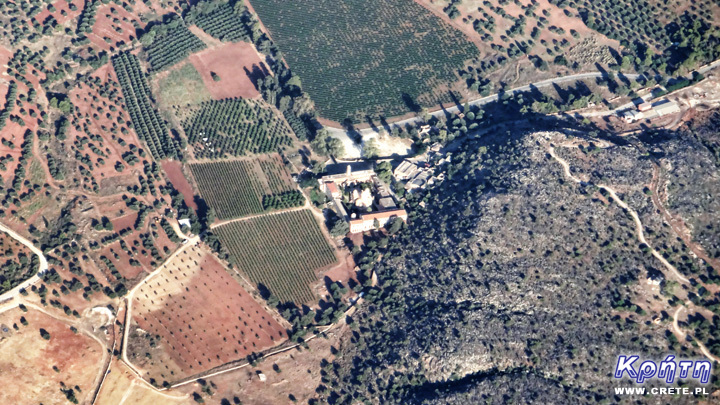 Nowadays, the income that the schools in Chania benefit from, which the monastery finances. A seminary has also been operating here since 1892, and the monastery itself plays an important role both in the local economy and in the life of the church in Crete. The access road to Agia Triada is unusual for Crete and is more like some Polish roads planted with even rows of trees with whitewashed trunks. After reaching the place, the car can be parked just below the monastery on a large gravel parking lot. Looking at the raw outer buildings surrounding the monastery, we do not know what to expect from its interior. The west wing in which the entrance gate is located is the place where the monks have their goals. It is their windows that are visible on both sides of the main gate. The stairs in the middle lead straight to the impressive stone main entrance made in Venetian style. After passing the gate leading to the square courtyard, the simplicity of the outer walls disappears. Just in front of the entrance in the middle is an impressive Byzantine church with a stone façade and three characteristic domes. The courtyard literally sinks in greenery, which beautifully contrasts with the orange color of the buildings. Cretan monasteries are generally beautiful and well cared for, but it's hard for a Muslim to refuse the charm, however Agia Triada is distinguisheddefinitely on their background. The unusual architecture surrounded by ubiquitous plants and the atmosphere of peace, which even monastic cats experience, make the Agia Triada Tzagarolon Monastery memorable, while the memorable photos taken here always impress. In the monastery there is also a museum with icons, old codes and manuscripts. You can also see souvenirs that stopped the stormy moments and today they can testify about the great wealth of this monastery. There is also a large library with rare books and a shop where you can buy products made by monks. Going to the monastery of Agia Triada, we strongly advise you not to drive through the center of Chania, where even in the midst of one-way streets you may go astray even to experienced drivers. The easiest way to get to this monastery is to use the New National Road, which allows you to quickly get to the intersection, where it crosses the road leading to the airport. Agia Triada Monastery is only a few kilometers north of the international airport. Ioannis Daskalogiannisi. After reaching the airport area, look for further (not always formal) signposts for this monastery. The monastery Agia Triada is in our opinion one of the places that must be included in the list of attractions that are planned to visit in the western region of Crete. Agia Triada is a very unique, climatic monastery, which we recommend even to people who usually avoid visiting sacred buildings. When planning a visit to this monastery, it is worth taking into account the requirements of the monks regarding the outfit, which should be modest, but in no way stingy. Entering the area costs only 2 €. Super, że przekazałeś nam tę informację. Dziękujemy. Redirected from the site - Kato Preveli. Currently, the lower monastery is still not open to the public and is not used by the monks. The buildings of the upper monastery have undergone partial renovation and are the main seat of the Preveli monastery.